Michael Bradford is a multi-platinum producer and songwriter, having produced work for a diverse group of artists, ranging from Anita Baker to Kid Rock, and from Stevie Nicks to Beth Hart. Michael’s songwriting catalog includes several hits for Uncle Kracker, including his global smash “Follow Me”, which Michael also co-produced. An accomplished composer and orchestra arranger, Michael spent many years in the employ of the legendary Paul Buckmaster (Elton John, Train), where he learned the essential arts of composing for Film and television, as well as arranging for large and small orchestras. Michael’s arranging skills have been heard on a variety of hits, as well as in live performances, such as Ringo Starr’s “Liverpool 8” tour and Dave Stewart’s “Tower of London” concerts, where Michael served as Bassist and Musical Director. 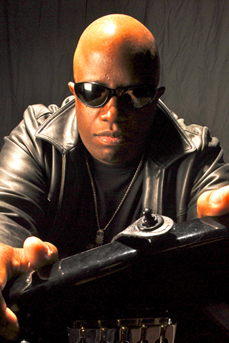 An early pioneer of Electronic Music and DJ culture, Michael recorded for several years under the moniker “Chunky Style”, a period that included his hit remix of Lonnie Liston Smith’s classic “Expansions”, and his work with the dance group Pure Sugar and underground artists Mankind Liberation Front. Michael has a long-running association with Moog Music, as an endorsed artist, as well as a proponent of bringing synthesizers into education at the university level. As a live musician, Michael has had an exciting and eclectic career, performing with Kid Rock, Uncle Kracker, Ringo Starr, Eurythmics and Richie Sambora, to name but a few. As a recording artist, Michael’s recent album “THE LONG NIGHT” was critically acclaimed, with Paul Zollo of American Songwriter Magazine coining a new term to describe it: “Funk Noir”. Michael’s next album project will feature downtempo remixes of some of cinema’s most famous scores, all by composer Bernard Herrmann, combining his two loves, film music and electronics. In the underground dance scene, Michael has had a series of #1 remixes that he has produced for AV Super Sunshine, including their latest release “Orange”. Michael’s studio, Chunky Style Music, is a creative laboratory, abuzz with guitars, amps, drums, turntables, synthesizers and analog and digital recording technology, all interfaced into a classic Trident Console, circa 1974. With new compositions and collaborations in the works, Michael plans on moving even further into the worlds of composition and multi-media performance. His endless search for sound ensure a future of musical discovery.